How do you know if the SOL to collect a debt is reset? How do I know if the debt collection statute of limitations has been reset? I have recently been contacted about two old loans from Oxford Law, LLC out of PA. They do not appear to be a legit Law office, from all the comments I have read on the internet. I live in Michigan and believe the SOL to be 6 years. One of the loans they are referencing no longer is appearing on my credit report. The other loan, the last payment was made in March of 2007, according to my credit report. Under account history of the loan, it states "Charge Off as of Aug 2008 to May 2011", the status of the account reads: Closed. $x amount written off. $x amount past due as of Jun2011, would this mean the SOL is reset to 2011 even though last payment was made in 2007? I did contact the original creditor back then to resolve, but was told the accounts were closed and nothing could be done and they would not be coming after me a later date. The credit report does show the loan with the original creditor and does not reference any where the law office contacting me or the current owner of the debt, Milan Investments. How do I know if the SOL has been reset? You are working with what are two different SOL time frames (statute of limitations). One is for resetting the SOL to legitimately sue (which can happen), and the other for re-aging the time for a negative item to remain on your credit report (which cannot). One set of laws will vary by state, and the other is covered by federal Fair Credit Reporting (FCRA) laws. Lets take a look at how both apply to you given the information you shared. SOL to legitimately sue in your state. Michigan, similar to many other states, has a 6 year limit for how long you can be sued for collection on open accounts, like revolving consumer credit cards; loans that may be revolving, like personal lines of credit; and even loans that are fixed, and governed narrowly by a written agreement. If it has been six years since you last paid anything on the debts at issue, Milan Investments, nor Oxford Law LLC in Pennsylvania, can legitimately sue you. That is to say, they could file the suit, but you can defend that quickly and simply as being time barred. The last payment reference of 2011 on your credit reports appears to be erroneous. In Michigan, you renew the SOL to be sued, when you do so in writing. You can review the governing statute here. Speaking to the creditor, a debt collector, or a new debt owner does not reset the SOL clock to sue in your state (but it can in others). Credit reporting SOL for accounts in collection. Your credit reports will continue to show unpaid debts on your credit reports for up to 7.5 years from when you first missed your payments. That SOL for reporting is governed by the FCRA at the federal level. There are some exceptions to this, like New York law for paid collections. But I am not aware of anything different regarding credit reporting in Michigan. With your last payment to the creditor being March of 2007, this should be coming off of your credit report in a matter of weeks. The charge off reporting showing for the following year should not impact this (but unfortunately can). And though you mention that neither Oxford Law or Milan Investments are showing on your credit reports, any collection entry on your credit reports (other than a judgment for the same debt) should fall off at the same time as the loan originators reporting (also something to be watchful of). You can dispute the credit reporting as too old to continue to appear on your credit reports. Send your dispute to the credit bureaus certified mail return receipt requested. You can send a copy of your dispute addressed to the company(s) reporting the collection account. Keep a copy of all that you send, and the green return cards you get, for your records. Post a follow up to the results of those disputes, and if items continue to show in your reports that should not, let’s take it from there. Who is the original creditor? Anyone with concerns about resetting or renewing the SOL to be sued in your state is welcome to post questions and concerns in the comments below for feedback about you situation. 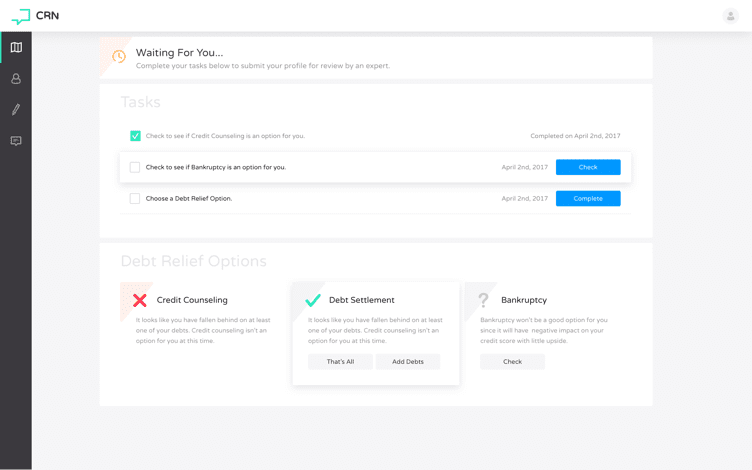 If you’ve fallen behind on your payments, then we can help you settle them with your creditor directly through our platform. I got a call from dynamic recovery solutions on an old time barred debt from 02 and 06.. i politely told them to kick rocks and i dispute everything. a few days later i got an email from them stating the enclosed email had info to verify the debt. I didnt open it and thought they was suppose to send letter. What should i do or send the agency? Email is not normal for debt collectors to send yet. If the debt is passed your state SOL to legitimately sue, or to show on your credit reports, and you have no intention of dealing with Dynamic Recovery, you could send them a cease communication notice (send certified mail). The CFPB offers some example letters for debt collectors. i have already checked. In alabama its only 3 years.. and they did indeed send me a validation of info through email but i didnt open. When a debt is passed the SOL to sue and I do not intend to resolve it, I care nothing about what a debt collector thinks. Check out this video about zombie debt. I live in California and I have an old HSBC debt that I Last made a payment in 2011. A person claiming to be an attorney is saying that they are suing and is not considered SOL because it has been sold twice since than. I was wondering if that is true. They also told me that they would be serving me tomorrow between 8:00- 4:00. The SOL to sue cannot be reset by the debt being sold to another debt collector. Add to that the reference to some serving you the next day, you appear to be dealing with a debt collection scam. I’m getting divorce. Been going on over year. Illinois. I’m 70. Husband 55. I have soc.sec $1422 mo. I am to receive $2500 mo for maintenance for life. Now husband out of work. I have 75k credit card bills all credit in my name. Mortgage in my name owe $209,000,. Only one bill delinquent one husband used. Can I take money from my IRA to live and file bk on credit cards or can creditors take my IRA monies. Talk over your options with an experienced bankruptcy attorney. Your IRA is typically protected from creditors. In Nevada (community property state)….if credit card is just in my name, can creditor sue spouse for payment? Or get a judgement from spouse? Talk to an experienced debt collection defense attorney in Nevada. I can email you a list if you like? I do not see that happen too often, even in community property states. Ty, in a couple days I will fill out the form to have the opportunity to talk with you. I am current with debt at this time, would like to run my situation past you for your insight. Hello. By way of background, I have been making monthly payments with Key Bank’s recovery department for a few years now, and currently owe a balance of $34,666.53 for my private student loans. I live in NJ. I recently called Key Bank to make my usual monthly agreed upon payment of $450 per month. During the call I was told by the account manager that as off July 21, 2016, my loans were in “out of statute stauts.” He also informed me that 6 years had just passed since the loan was “charged off” back in July 21, 2010. As such, he said that under NJ law, Key Bank could no longer sue me for the balance or sell the loan to a third party. Basically he said I could continue to make voluntary payments if I wanted to but Key Bank could not do anything to make me pay. I requested some kind of letter from him but he said they do not provide one. I am not sure if my situation is a result of the SOL running out on Key Bank. Did my payments after the charge off back in July 2010 toll the SOL? Have you heard of another person facing a similar situation? Does this sound legit? Should I keep paying them? I have not looked at my credit report in years. Generally speaking, when you make a payment on debt it reset the SOL. Your account being classified the way the Key bank employee outlined, at least in my experience, is a mistake. It could come back to haunt if you stopped paying. Call me for a quick consult to go over a few questions. You can reach me at 800-939-8357, ext 2, or submit the “Talk to Michael” form in the right column on this page. I was just contacted today by Dynamic Recovery Solutions saying that I owe $4800 for a Wells Fargo Student Loan for Sac State that was taken out in jan. of 2007. I asked them to provide back up they would not. I contacted Wells fargo who we have checking, saving and home mortgage with and they said they have no record of me taking a loan. I should mention we are in CA. I then calll DRS back and tell them this and they respond saying wells fargo wouldn’t have a record as they sold the loan to their client USI solutions Inc. So i call them again they will not send me any proof that this loan exists and has not paid. They confirm it is for a wells fargo student loan taken in jan. of 2007 defaulted in 2009 and my grandmother Mercedes is on the loan. She died in 2006. They guy at USI Solutions said WF sold the loan to Milan Investments and if i want back up i need to physically mail a request to Oxford Law in PA. and if i do so there would be serious repercussions and that they know i own my house and how much it is worth. I spoke to my mother and she said I did have a student loan with WF but it was when i was at chico state in 2002. she also said she thought it had been paid off. Both my husband are currently paying all of our student loans off and are in good standing. I just checked my 3 credit reports and no where is there a loan from WF other than my mortgage. I don’t know what to do. I have worked really hard to get my credit in the 700’s and i dont want to ruin it. But i also don’t want to pay this if it is a scam. I also don’t appreciate them threatening to come after my home. How do I know if this legitimate? my mom said i should just ignore it, but like i said i don’t want my credit ruined by this. I had a situation a few years ago on this site that somewhat tracked back to Oxford Law. It had to do with a debt collector acting out in the comments on a different page of the site. If you read this page about a debt collector with Cach LLC behaving badly, you will know why I removed your name and changed your initials too. I am skeptical of anything to do with Oxford Law, and would like any information you can provide to me about who all is involved, whether that be with Dynamic, or anyone in PA. You can send the details to info at consumerrecoverynetwork.com. You are welcome to call me too, at 800-939-8357 ext 2. I would encourage you file a debt collection complaint with the CFPB. The SOL to legitimately sue in California is 4 years. You are passed that. The limit for this to appear on your credit is as much as 7.5 years. You are passed that. If this appears on your credit let me know and we can go from there. Hello, quick question on Statute of limitations. I lived in Washington state and moved out of an apt in Jan 2012 without doing the walk through first. I moved to California the same day and later got a bill for $400 expenses not covered by my security deposit. I know they were not my damages but I was already out of state so i just forgot about about it. It showed up on my credit report in 2015 for twice that amount now (interest). I now live in California where the SOL is 4 years but WA state SOL is 6 years. Which states SOL applies here? Talk to an experienced debt defense attorney to be sure. My take is that California SOL applies. Did you receive that bill at the new California address? That means they know where you live, but that the SOL has passed. It can make it easier to settle for a good savings if you choose to at some point. Hello. This has been helpful but I still have some questions regarding my particular situation. I had a car repossessed back in September of 2004. I was living in Michigan at the time. The original debtor received a judgement against me in July of 2005 but I did not make any payments. I moved out of state to Colorado in September 2005 to get family help with getting back on my feet. I got a job and then was transferred to Indiana in December 2009. I have not received any communication regarding this debt until recently. I got a court summons stating that I was being sued by the finance company I got my vehicle through, but this debt is nearly 11 years old. I have checked my credit report and it has been removed from all 3 bureaus. My question is this: is it possible that I reset the clock on the SOL due to my 2 moves? If not, how do I handle the court summons? I know I have to appear, but what exactly should I do to handle things once I get to court? It would be odd for the auto lender to sue you again if they already have a judgment against you. It is common to be served legal papers when the judgment creditor wants to bring you back into the court to show assets and income in order to collect on the prior judgment. It is also common to have a judgment be brought into the courts in a new state in order to domesticate it in that state so that they can force collection. You may not be dealing with an SOL issue in the way that you are currently concerned with. How much is owed to the finance company today? Yes it was in Feb 2012. I cannot afford an attorney and will go to the bench trial with the hope of negotiating for 50% and paying it with my tax refund in 2017. I plan to show I have no savings and meet my bill obligations with little left over. What is the likelihood of a settlement at a bench trial with a one time payment not occurring for 10 months? My experience would suggest you have zero chance of getting a settlement agreement for payment 10 months later formalized in the court. You could let the chips fall where they may and get the deal you need 10 months later. Just not set up by the judge. You would simply begin the negotiations when you are close to ready next year. How does that work if I have a bench trial on May 19? How can I postpone negotiations until I am able to pay next year? I will research bench trial processes to get more informed. You probably can’t postpone that long. You would likely end up with a judgment and then settle it later when you are able. You will want to be prepared for court. You may even see opportunities in the court process the more prepared you are. You may want to check with any local college law programs (if universities nearby), and see if there are any professor/student clinics available to the public. Some campuses have those. I am being sued by Bank of America for $5455 for an old credit card debt. I live in Texas and closed this account on Feb 29 2012 as I had over $33600 in card debt that I couldn’t manage to meet the minimum payments. I settled two of the three accounts I had outstanding but BofA was not willing so I closed the account. I had not heard from them until March 5 2015 when I was served a Justice Court Citation stating I was being sued. I replied within the time frame acknowledging the debt but disputing the amount as they had shown $5800 and the last payment made which the citation reflected Aug 29 2012. I just received on April 8 2016 a notice to appear for a bench trial on May 19 2016. My question is are they entitled to pursue this debt on May 19 2016 after the 4 year statute of limitation expired on March 1 2016? Based on what you shared, it appears they filed the suit well within the 4 years. The SOL does not continue to tick through to today. It stopped when they filed back in 2015. Is the date you last paid different than what they asserted as being in August of 2012? Is the sol different on a business than an a personal credit card? I live in Kansas. A revolving open ended account like a credit card will not have a different SOL in Kansas no matter if the account is a business debt or a consumer account. I had a debt of $14.00 for late movie fees from 2002. A local debt company has sent me bills over the years starting with the first one at 995.97 for various “fees” of which I never paid. I recently got papers in the mail saying the filed for a judgement in court for payment for the same charge of 14.00, but now want 2,999! It’s been over 10 years Do I have to pay it or is there some statue of limitations? Is the paperwork you are referring to a lawsuit you were just served with, or is paperwork related to collecting a judgment that has been in the court for some time? What is the name of the Plaintiff suing? Hello, I live in NJ but I had a private student loan that defaulted in PA the date opened was 11-25-2009 and closed on 09-30-2009. I recently called the collection agency to inquire about the loan. Did I reset the SOL clock by doing that? Looks like the statue of limitations is up in both state NJ & PA.
You would typically have to send in a written acknowledgment of the debt in New Jersey to risk restarting the SOL to legitimately sue. I had five credit cards and one electricity bill that I stopped paying since 04/15/2011 because I lost my job and at that time I had no savings that will cover enough even to pay the minimum amount. All of them ranged from ($500-$1100) except for electricity bills that was around $290. The total collection amount sums up around $4200. As per my Trans-union report, All of them will be removed from my credit report by April 2018.I do not have any plans of buying any assets for next year or two. At the same time I have enough savings to pay those collection bills. 1) Should I be paying the collection bills If my accounts are running in 5 yrs since my first delinquency date , considering SOL from my state is 6 yrs (MN)? I would probably look to settle with any collectors that I know have the potential to sue. Post a reply with who the debt collectors are on each account and I will reply with those that tend to sue in the months leading up to the SOL expiring. Both Cavalry and PRA are actively filing lawsuit to collect. If I had the resources to work with I would look to settle with them for less than half the balance owed. Check out both of those links for more about negotiating with either debt buyer. I took out 3 private student loans while in school (2003, 2004, 2005). I left school in around 2006 and the loans wound up in default. Based on an old credit report (they are no longer on my credit file) all three show a first time late of March 2007. Based on that same report they were sold to Weltman, Weinberg & Reis in October 2009. I live in North Carolina and lived there at the time I secured the loans. I’ve not heard anything from this law firm. I also filed ch 13 bankruptcy in March 2011. When the bankruptcy is discharged can they take action? What is my recourse? Are the student loans included in your chapter 13 repayment? If not, why weren’t they? If those loans are not part of your chapter 13, and have not been paid since March 2007, the SOL to legitimately sue in North Carolina would appear to have expired in 2010 (3 years). Bankruptcy tolls, or can put a pause on the SOL clock until you leave the courts protection, but from what you shared, the time to sue you had already lapsed. You can restart the SOL in certain ways. Talk this over with your bankruptcy attorney and find out what happened in your case. If you cannot be sued legitimately, and the debts are not appearing on your credit reports, it does not mean the student loans cannot be collected. The loans are still valid collection accounts. But collection leverage is removed on private student loans (not federal loans) at that point. Hi! I need some input. Yesterday, out of nowhere, a credit agency called and said they were going to sue us for a debt that is from 2006. My husband kind of panicked and agreed to a “post dated” payment for later this month to pay it off. Upon further inspection about the laws, I understand the SOL runs out on this type of debt (Home Depot credit card) after 6 years. The creditor claimed though that because we signed a contract with the company, they technically have 10 years to sue and it’s coming up on the end mark of the ten years in a few months. I guess my question is, is her information accurate or is this all scare tactics to get us to pay? It isn’t on our credit report anymore, but she claimed it would “improve” the score once it’s paid. Did my husband reopen the SOL by agreeing to pay, even if no payment has gone through? I can’t find the answer anywhere. We are in Ohio, and the company threatening to sue is located in New York. Any help would be appreciated! Thanks! What is the name of the debt collection agency? If it were me I would call my bank and make sure no payments go through to the debt collector. If the account with Home Depot was a revolving balance it will typically have a 6 year SOL to sue. I believe they did use scare tactics to get you to commit to paying, which could reset the SOL, but perhaps not when they used a deceptive practice to get the payment. I would stop the payment and call and talk to an experienced debt collection defense attorney. What part of Ohio are you in? I can email you contact details to the type of attorney you should talk with that offers a no cost initial consult. The deception to get a payment,and the bit about how paying will improve your credit, are definitely something to bring up with the right attorney that fights against this kind of thing everyday. You likely did restart the SOL with a payment. If you feel you were tricked into doing so it would be a good idea to run your situation by an experienced consumer attorney in North Carolina with a practice that focuses on collection law violations. I can refer you to one for a no cost consultation if you like? ….I feel like such an idiot. I have worked so hard to get my credit reports down to 3 open issues I intend to take care of and new and positive information….. I feel like I was tricked yes, Had I known that they were addressing this as it fell off my reports and had I know that they were readdressing after the SOL…UGH…. If you wouldn’t mind. I’ll take the name of someone you suggest. I am in the Asheville NC area. Thanks so much. I sent you an email with attorney contact details. Let me know how things progress. I received a letter from Oxford Law stating I owe PNC $198.43 for a bank overdraft from 2001. I was contacted last year from another debt collector for the same amount. I went to PNC bank and they checked their system and there is nothing stating I owe them any money for anything. I received a letter stating this from PNC. I spoke with Oxford Law and explained I have a letter from PNC stating I owe nothing. I also asked for all written information regarding this debt, The representative stated he did not have that information. When I asked him to find someone who could get that information he became rude and began to talk over me. He then proceeded to tell me that maybe I forgot about the debt. I once again told him I have a letter from PNC stating I owe nothing. I also explained I just had a Security Clearance check from the DoD and they found nothing on my credit report or history showing debt to PNC. He became even more rude and hung up. I would send them a cease communication letter. The debt appears to be too old to legitimately sue for collection, or to be reported on your credit. There is nothing a debt collector like Oxford Law can do but buzz around and annoy. Michael, just an update on Convergent. I called them today to verify the SOL on the debt. Last payment was 4-07. I was told that their letter included the time-barred acknowledgment. It did not. I advised her that WV law requires that it be stated (thanks for the link). She said it was on the back of the letter and when she looked herself she could not find it and decided to transfer me to a supervisor. After holding for several minutes for a supervisor I realized she had hung up on me lol. I have placed a call to one of the attorneys that you sent me concerning the other two issues. Waiting to hear back. Will update any progress. Thanks again for your time. It didn’t occur to me that there might be a legal defense to the judgment being unlawfully entered until I looked closer at the paperwork. I would appreciate any recommended experienced attorney’s in WV that I can talk with. Please send me their contact info. Thank you for your time. While awaiting your response, I will address my next question. I have an account with Asset Acceptance (original creditor is Citibank for $6903 on my 2010 credit report. Date of first delinquency shown is 7-07) showing a balance due as of $10, 087 as of 11-14. No payment was made after this. This entry dropped from my credit report in 4-14. They sent a settlement offer of $1513 in 11-14 which was a great offer but still could not pay within 3 weeks. They are calling now again. I spoke with an attorney this morning on another issue, and he advised that credit cards are considered written contracts in WV and have a 10 year SOL. I am wondering about that simply because Beneficial has already been time-barred and date of first delinquency is 4-07, just 3 months prior to Citibank. Should I speak with them and see if SOL for suit has expired? I do not want to restart it if it has. If it hasn’t, should I try to bargain back to the offer of $1513? I should be able to save that much by May. Double check what the attorney said about the 10 year SOL applying, as I suspect it may be 5 years. I will send you an email with contact details to attorneys in West Virginia that I know to be active in consumer law and debt collection defenses. The fact that the debt collectors are disclosing the SOL expiration in their communications with you are also an indication. Those attorneys I email you tend to offer a no cost initial consult, so it makes sense to call and get one or more of them to weigh in. Are you looking to settle debts even if you confirm the SOL to legitimately sue has expired, and the collections are no longer appearing on your credit report? It is okay if you are, I am just curious if settling is motivated from fear of being sued more than anything else. Yes, fear of being sued..again. That leads to my final question. I was sued in July 2009 by Discover (Booth & McCarthy) for $5,825. The paperwork came in the mail and I called the collector to make payments arrangements. I received notice from the court that the action had been removed from the docket. I was able to make a payment or two and that was all. I never heard another word from them. To bring this to date..I inherited a small piece of property in 96 and have been trying to sell it for quite some time. Two weeks ago I was approached with an offer. When the deal went to their attorney, I was contacted about a lien placed by a judgment by Discover. I went to our courthouse and looked at judgments and did find a judgment entered on the property dated 7-09. There were 2 entries for the same judgment on the same property. 7-09 and 2-11. The attorney doing the work for the person wanting to buy just happened to be in the records room and stopped to talk to me. I asked him why there were 2 entries and he said they were the same thing. Evidently, Booth had transferred it to Atkins Law. I am so confused. I spoke with same attorney this morning and he said because the offer was made to purchase, that he could contact them and see if they would accept what I would clear on the sale after all costs and release all claims. He couldn’t guarantee it. It could be a difference of a few thousand dollars. I am now scared that they might attach other joint property (home and extra lot) or bank account. This thing has laid dormant since 2009 and now has reared it’s ugly head. I honestly don’t know what to do. I do not work and very worried. That’s why I am trying to nail down where I stand on the other two. My story isn’t as tragic as some I have read here, but please anyone reading…DO NOT let a judgment happen. I should have commented above that my credit report pulled last week shows no negative information. I have been using Credit Karma to monitor and saw my score jump to 743 from 6 something in January. I did not pay extra through Annual Credit Report to get my score so I don’t know what it shows but understand it should be close. Also, after my last post, I got my mail and there was a letter from Convergent offering a settlement. I have looked closely at front and back and do not see the time barred disclaimer. Talk that over with one of the attorneys too. If the court case was removed, only to later appear without your being notified and given the opportunity to appear, that may be a problem. It may be better to work with an attorney, with the experience you need, in order to vacate a judgment, as compared to some form of partial settlement to move the property. Hello, I live in WV. I have a few questions. I will begin with what I believe to be the easiest one to answer. I have a charged off and transferred loan for $6012 (original creditor is Beneficial Finance opened in 8-05). This entry removed from my credit report 7-12. It appears (from my 2010 credit report) that Hudson and Keyse picked it up in 9-09 for $6105. This entry also removed from credit report in 3-14. I received 2 letters from P&B Capital for $6105 dated 3-12 and 4-12 that never made it to my report. Next letter received from Jefferson Capital in 1-14 for $9666.53! Same debt! I looked at the back side of the letter and found a time barred acknowledgement. It stated that the debt was indeed time barred and that any payment or promise to pay would not restart the SOL for the debt and that if transferred, the new collector would be required to honor it. Now..Convergent is calling about said debt. I acknowledged my name but nothing else. What is my best course of action to put this to rest once and for all. Thank you for your time. I will address my other questions in a separate post. An unpaid debt never truly goes away. Once the SOL to legitimately sue, and for credit reporting have passed, it is as good as gone. If you never want to hear from the new debt collector again you can send a cease communication letter certified mail return receipt. Keep a copy of the letter and return card you get back from the USPS. If that same collector contact you again, post an update and lets go from there. Thank you Michael. Should I talk to Convergent when they call again and have them confirm the SOL expiration? Or, just send them a letter as you suggest? I am not overly concerned about additional phone calls from them..only that I cannot be sued. The information you provided about the account being last paid in 2005, and the other 2 credit report entries having aged off in 2012, suggest the SOL to file a lawsuit has passed. You can certainly call Convergent to verify that. I have a judgement in Oklahoma from Jan 2009. The SOL in Oklahoma is 5 years so it has already past. I also understand the judgement will fall off my credit report in just one year. Unfortunately I am trying to buy a house in the immediate future and have been told this judgement could be an issue with underwriting. The original judgement was filed by Arrow Financial Services and in Oct 2011 moved to LVNV. I would like to have the judgement settled but don’t want to open Pandora’s box by resetting the SOL. How and whom should I approach to settle this judgement. How much is the judgment, and what are you able to pull together to offer as settlement? I want to be sure I understand what happened. Arrow got the judgment. That was transferred to LVNV. At no time in the last 6 years was the judgment renewed. Have you checked the court record or called the clerk to verify this was not renewed? With a judgment that has remained unpaid this long, and when negotiated well, I would realistically target roughly half of today’s balance as a settlement. There are reasons to aim lower, but if your finances are on track well enough to be looking at buying a home, some of those reasons may not apply. If the judgment was not renewed, I may think about leveraging that for a lower settlement deal. But that would be me hitting this from an uninterested third party angle. Perhaps you would simply want to get past this in order to accomplish your goal of buying the home. The dollar amount of the debt, and how much you can afford to pay, can also impact how deep you dig your heels in when negotiating. Your calling to negotiate a settlement on a judgment will not reset the SOL. The statute of limitations to press on the extra ordinary collection options that come with a court judgment do not reset like that. But I would encourage you to talk that over with an experienced debt collection defense attorney in OK.
Micheal, what exactly is needed to show that a debt is past its SOL? If they do sue me, is it just their word against mine? Would a credit report work? What about the account that is no longer appearing on my report due to its age? Them suing means they would have to disprove your defense claim that they are time barred by the state SOL to bring any collection action. Old debts like this are hard to prove when they are within the SOL (when challenged and defended well), let alone when outside the SOL. An original creditors records about receiving the last payment might work if the original creditor employee familiar with books, records, practices were available to testify. And original creditor authentication is just not that common with older debts. It is becoming more common, but that shift is only a couple years old at best. From what you shared, your stuff is old enough to be part of some of the worst records and ability to authenticate we have ever seen. Thanks for your advice Michael! Two more questions for you. I have yet to respond or talk with Oxford Law regarding these old debts. Should I? By ignoring the letters am I validating the debts and they will sue? The letter states “at this time, no attorney with this firm has personally reviewed the particular circumstances of your account. We are acting solely in our capacity as debt collectors relevant to your account”. Then in bold letters at the bottom states “this communication is from a debt collector. This is an attempt to collect a debt and any information obtained will be used for this purpose”. So do I respond? And if so how should I do so? Also, if I still have one year left for negative reporting on my credit report, should I still write dispute letters to the credit agencies to get them removed? Thanks! You have a window of opportunity to request validation of the debt. If you are confident the SOL to sue is expired, and payment is not your goal, but you just want to be sure you are paying the correct party, I personally would not send the validation request. I would be more prone to send a cease communication letter so that they would go away, and I would not have to hear from them anymore. But again, only if the SOL to legitimately use the courts is passed, and if I had no intention of paying, or settling the collections. Do you have any major credit or financing goals between now and when the credit reporting is up? I do not have any financing goals in the future. I tried to resolve these when I was still working a few years back, but they didn’t want to work with me. So, now, I am a stay at home mom with no income coming in. I am married, but no joint accounts with my husband. So, not planning on paying these now. As far as the SOL all I have to go by is my credit report for the last payment made. No finance or credit goals between now and when this drops off your credit would mean, to me, either sending a cease communication letter (certified return receipt), or doing nothing, are what I would do. Hi I have a debt that’s past the Statute of limitations. I want to settle, but I am a little confused about restarting the SOL. Ive heard that acknowledging the debt can restart the SOL. Is this the case, only if it’s within the SOL (6 years for Hawaii) or regardless (past the SOL, over 6 Years). Thanks in advance. The reference I found to the Hawaii debt collection SOL being restarted is here. Locating and reviewing other references and cases did not give me a definitive on whether verbally acknowledging the debt restarted the SOL, while doing so in writing does. I can connect you with an experienced consumer debt collection attorney in Honolulu that offers no cost initial consults if you like? Who is the debt with now? Hi It’s in the hands of Asset Acceptance Corp Originally Chase. Settling a collection debt this old, and with Asset Acceptance, I would target at between 30 and 40 percent. Sorry, I was looking at the wrong loan on my credit report, the last payment was April 2008, so, I can still use SOL as a defense if they threaten to sue but have another year for the negative item to come off my report? There are no judgements, just negative items with Wells Fargo. These were private student loans, I actually had four total, but two have been removed from my credit report already. Honestly, I do not recall the original creditor when I opened around 2000. Wells Fargo purchased the loan and I made payments to them for a few years before things went bad. So, I cannot imagine these people would even have my signed contract. I sincerely doubt they would have your signed contract. Because of the loan or entity purchase, Wells Fargo is, for all intent and purpose, your original creditor on this one.